For other uses, see Calculus (medicine), Enterolith, and Nodule (geology). A concretion is a hard, compact mass of matter formed by the precipitation of mineral cement within the spaces between particles, and is found in sedimentary rock or soil. Concretions are often ovoid or spherical in shape, although irregular shapes also occur. The word 'concretion' is derived from the Latin con meaning 'together' and crescere meaning 'to grow'. Concretions form within layers of sedimentary strata that have already been deposited. They usually form early in the burial history of the sediment, before the rest of the sediment is hardened into rock. This concretionary cement often makes the concretion harder and more resistant to weathering than the host stratum. There is an important distinction to draw between concretions and nodules. Concretions are formed from mineral precipitation around some kind of nucleus while a nodule is a replacement body. Descriptions dating from the 18th century attest to the fact that concretions have long been regarded as geological curiosities. Because of the variety of unusual shapes, sizes and compositions, concretions have been interpreted to be dinosaur eggs, animal and plant fossils (called pseudofossils), extraterrestrial debris or human artifacts. Detailed studies (i.e., Boles et al., 1985; Thyne and Boles, 1989; Scotchman, 1991; Mozley and Burns, 1993; McBride et al., 2003; Chan et al., 2005; Mozley and Davis, 2005) published in peer-reviewed journals have demonstrated that concretions form after sediments are buried but before the sediment is fully lithified during diagenesis. They typically form when a mineral precipitates and cements sediment around a nucleus, which is often organic, such as a leaf, tooth, piece of shell or fossil. For this reason, fossil collectors commonly break open concretions in their search for fossil animal and plant specimens. Some of the most unusual concretion nuclei, as documented by Al-Agha et al. (1995), are World War II military shells, bombs, and shrapnel, which are found inside siderite concretions found in an English coastal salt marsh. Depending on the environmental conditions present at the time of their formation, concretions can be created by either concentric or pervasive growth (Mozley, 1996; Raiswell and Fisher, 2000). In concentric growth, the concretion grows as successive layers of mineral precipitate around a central core. This process results in roughly spherical concretions that grow with time. In the case of pervasive growth, cementation of the host sediments, by infilling of its pore space by precipitated minerals, occurs simultaneously throughout the volume of the area, which in time becomes a concretion. Concretions are often exposed at the surface by subsequent erosion that removes the weaker, uncemented material. Samples of small rock concretions found at Hells Hollow State Park in Pennsylvania. Concretions vary in shape, hardness and size, ranging from objects that require a magnifying lens to be clearly visible to huge bodies three meters in diameter and weighing several thousand pounds. The giant, red concretions occurring in Theodore Roosevelt National Park, in North Dakota, are almost 3 m (9.8 ft) in diameter. Spheroidal concretions, as large as 9 m (30 ft) in diameter, have been found eroding out of the Qasr El Sagha Formation within the Faiyum depression of Egypt. Concretions are usually similar in color to the rock in which they are found. Concretions occur in a wide variety of shapes, including spheres, disks, tubes, and grape-like or soap bubble-like aggregates. They are commonly composed of a carbonate mineral such as calcite; an amorphous or microcrystalline form of silica such as chert, flint, or jasper; or an iron oxide or hydroxide such as goethite and hematite. They can also be composed of other minerals that include dolomite, ankerite, siderite, pyrite, marcasite, barite and gypsum. Although concretions often consist of a single dominant mineral, other minerals can be present depending on the environmental conditions which created them. For example, carbonate concretions, which form in response to the reduction of sulfates by bacteria, often contain minor percentages of pyrite. Other concretions, which formed as a result of microbial sulfate reduction, consist of a mixture of calcite, barite, and pyrite. Mosaic shows spherules, some partly embedded, spread over (smaller) soil grains on the Martian surface. Concretions are found in a variety of rocks, but are particularly common in shales, siltstones, and sandstones. They often outwardly resemble fossils or rocks that look as if they do not belong to the stratum in which they were found. Occasionally, concretions contain a fossil, either as its nucleus or as a component that was incorporated during its growth but concretions are not fossils themselves. They appear in nodular patches, concentrated along bedding planes, protruding from weathered cliffsides, randomly distributed over mudhills or perched on soft pedestals. Small hematite concretions, dubbed "blueberries" due to their resemblance to blueberries in a muffin, have been observed by the Opportunity rover in the Eagle Crater on Mars. See Martian spherules. Concretions vary considerably in their compositions, shapes, sizes and modes of origin. "Septaria" redirects here. For the genus of gastropod snail, see Septaria (gastropod). Septarian concretions or septarian nodules, are concretions containing angular cavities or cracks, called "septaria". The word comes from the Latin word septum; "partition", and refers to the cracks/separations in this kind of rock. Some websites incorrectly derive the term from the Latin word septem, meaning "seven". Cracks are highly variable in shape and volume, as well as the degree of shrinkage they indicate. Although it has commonly been assumed that concretions grew incrementally from the inside outwards, the fact that radially oriented cracks taper towards the margins of septarian concretions is taken as evidence that in these cases the periphery was stiffer while the inside was softer, presumably due to a gradient in the amount of cement precipitated. The process that created the septaria that characterize septarian concretions remains unclear. A number of mechanisms have been proposed, including the dehydration of clay-rich, gel-rich, or organic-rich cores; shrinkage of the concretion's center; expansion of gases produced by the decay of organic matter; or brittle fracturing or shrinkage of the concretion interior by either earthquakes or compaction (Pratt 2001; McBride et al. 2003). Septaria usually contain crystals, often calcite, that precipitated from circulating solutions. Siderite or pyrite coatings are also occasionally observed on the wall of the cavities present in the septaria, giving rise respectively to a panoply of bright reddish and golden colors. A spectacular example of septarian concretions, which are as much as 3 meters (9.8 feet) in diameter, are the Moeraki Boulders. These concretions are found eroding out of Paleocene mudstone of the Moeraki Formation exposed along the coast near Moeraki, South Island, New Zealand. They are composed of calcite-cemented mud with septarian veins of calcite and rare late-stage quartz and ferrous dolomite (Boles et al. 1985, Thyne and Boles 1989). Very similar concretions, which are as much as 3 meters (9.8 feet) in diameter and called "Koutu Boulders", litter the beach between Koutu and Kauwhare points along the south shore of the Hokianga Harbour of Hokianga, North Island, New Zealand. The much smaller septarian concretions found in the Kimmeridge Clay exposed in cliffs along the Wessex Coast of England are more typical examples of septarian concretions (Scotchman 1991). Cannonball concretions are large spherical concretions, which resemble cannonballs. These are found along the Cannonball River within Morton and Sioux Counties, North Dakota, and can reach 3 m (9.8 ft) in diameter. They were created by early cementation of sand and silt by calcite. Similar cannonball concretions, which are as much as 4 to 6 m (13 to 20 ft) in diameter, are found associated with sandstone outcrops of the Frontier Formation in northeast Utah and central Wyoming. They formed by the early cementation of sand by calcite (McBride et al. 2003). Somewhat weathered and eroded giant cannonball concretions, as large as 6 meters (20 feet) in diameter, occur in abundance at "Rock City" in Ottawa County, Kansas. 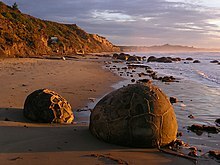 Large and spherical boulders are also found along Koekohe beach near Moeraki on the east coast of the South Island of New Zealand. The Moeraki Boulders and Koutu Boulders of New Zealand are examples of septarian concretions, which are also cannonball concretions. Large spherical rocks, which are found on the shore of Lake Huron near Kettle Point, Ontario, and locally known as "kettles", are typical cannonball concretions. Cannonball concretions have also been reported from Van Mijenfjorden, Spitsbergen; near Haines Junction, Yukon Territory, Canada; Jameson Land, East Greenland; near Mecevici, Ozimici, and Zavidovici in Bosnia-Herzegovina; in Alaska in the Kenai Peninsula Captain Cook State Park on north of Cook Inlet beach and on Kodiak Island northeast of Fossil Beach; Reports of cannonball concretions have also come from Bandeng and Zhanlong hills near Gongxi Town, Hunan Province, China. A model of Dinocochlea with Natural History Museum research scientist Paul Taylor as a scale. Hiatus concretions at the base of the Menuha Formation (Upper Cretaceous), the Negev, southern Israel. Hiatus concretion encrusted by bryozoans (thin, branching forms) and an edrioasteroid; Kope Formation (Upper Ordovician), northern Kentucky. Hiatus concretions are distinguished by their stratigraphic history of exhumation, exposure and reburial. They are found where submarine erosion has concentrated early diagenetic concretions as lag surfaces by washing away surrounding fine-grained sediments (Zaton 2010). Their significance for stratigraphy, sedimentology and paleontology was first noted by Voigt (1968) who referred to them as Hiatus-Konkretionen. "Hiatus" refers to the break in sedimentation that allowed this erosion and exposure. They are found throughout the fossil record but are most common during periods in which calcite sea conditions prevailed, such as the Ordovician, Jurassic and Cretaceous (Zaton 2010). Most are formed from the cemented infillings of burrow systems in siliciclastic or carbonate sediments. A distinctive feature of hiatus concretions separating them from other types is that they were often encrusted by marine organisms including bryozoans, echinoderms and tube worms in the Paleozoic (e.g., Wilson 1985) and bryozoans, oysters and tube worms in the Mesozoic and Cenozoic (e.g., Taylor and Wilson 2001). Hiatus concretions are also often significantly bored by worms and bivalves (Taylor and Wilson 2001). Elongate concretions form parallel to sedimentary strata and have been studied extensively due to the inferred influence of phreatic (saturated) zone groundwater flow direction on the orientation of the axis of elongation (e.g., Johnson, 1989; McBride et al., 1994; Mozley and Goodwin, 1995; Mozley and Davis, 2005). In addition to providing information about the orientation of past fluid flow in the host rock, elongate concretions can provide insight into local permeability trends (i.e., permeability correlation structure; Mozley and Davis, 1996), variation in groundwater velocity (Davis, 1999), and the types of geological features that influence flow. Elongate concretions are well known in the Kimmeridge Clay formation of northwest Europe. In outcrops, where they have acquired the name "doggers", they are typically only a few metres across, but in the subsurface they can be seen to penetrate up to tens of metres of along-hole dimension. Unlike limestone beds, however, it is impossible to consistently correlate them between even closely spaced wells. Moqui Marbles, hematite, goethite concretions, from the Navajo Sandstone of southeast Utah. The cube at the top is one cubic centimeter in size. Moqui Marbles, also called Moqui balls or "Moki marbles", are iron oxide concretions which can be found eroding in great abundance out of outcrops of the Navajo Sandstone within south-central and southeastern Utah. These concretions range in shape from spheres to discs, buttons, spiked balls, cylindrical forms, and other odd shapes. They range from pea-size to baseball-size. They were created by the precipitation of iron, which was dissolved in groundwater. They are further described by (Chan and Parry 2002, Chan et al. 2005, Loope et al. 2010, 2011). Kansas pop rocks are concretions of either iron sulfide, i.e. pyrite and marcasite, or in some cases jarosite, which are found in outcrops of the Smoky Hill Chalk Member of the Niobrara Formation within Gove County, Kansas. They are typically associated with thin layers of altered volcanic ash, called bentonite, that occur within the chalk comprising the Smoky Hill Chalk Member. A few of these concretions enclose, at least in part, large flattened valves of inoceramid bivalves. These concretions range in size from a few millimeters to as much as 0.7 m (2.3 ft) in length and 12 cm (0.39 ft) in thickness. Most of these concretions are oblate spheroids. Other "pop rocks" are small polycuboidal pyrite concretions, which are as much as 7 cm (0.23 ft) in diameter (Hattin 1982). These concretions are called "pop rocks" because they explode if thrown in a fire. Also, when they are either cut or hammered, they produce sparks and a burning sulfur smell. Contrary to what has been published on the Internet, none of the iron sulfide concretions, which are found in the Smoky Hill Chalk Member were created by either the replacement of fossils or by metamorphic processes. In fact, metamorphic rocks are completely absent from the Smoky Hill Chalk Member (Hattin 1982). Instead, all of these iron sulfide concretions were created by the precipitation of iron sulfides within anoxic marine calcareous ooze after it had accumulated and before it had lithified into chalk. Iron sulfide concretions, such as the Kansas Pop rocks, consisting of either pyrite and marcasite, are nonmagnetic (Hobbs and Hafner 1999). On the other hand, iron sulfide concretions, which either are composed of or contain either pyrrhotite or smythite, will be magnetic to varying degrees (Hoffmann, 1993). Prolonged heating of either a pyrite or marcasite concretion will convert portions of either mineral into pyrrhotite causing the concretion to become slightly magnetic. These so-called fairy stones consist of single or multiple discs, usually 6–10 cm in diameter and often with concentric grooves on their surfaces. They form in Quaternary clay as calcium carbonate migrates to some small fossil or pebble. Fairy stones are particularly common in the Harricana River valley in the Abitibi-Témiscamingue administrative region of Quebec, and in Östergötland county, Sweden. Cannonball concretion in Jameson Land, East Greenland. Concretion in the Cretaceous of western South Dakota. Encrusted hiatus concretion from the Kope Formation (Upper Ordovician) of Covington, Kentucky. Encrusters include bryozoans and crinoids. 'Kettle' concretion at Kettle Point, Ontario, defaced by graffiti. Clay dog – Naturally occurring clay formations that are sculpted by river currents and dried by the sun. ^ Glossary of terms in soil science (PDF). Ottawa: Agriculture Canada. 1976. p. 13. ISBN 0662015339. ^ "septarian". dictionary.reference.com. Retrieved March 20, 2014. ^ "SEPTARIAN NODULES". Archived from the original on 5 September 2013. ^ "Geological Survey Professional Paper". U.S. Government Printing Office. 24 May 1976 – via Google Books. ^ "The Epoch Times - Mysterious Huge Stone Eggs Discovered in Hunan Province". Archived from the original on 2007-04-21. Al-Agha, M.R., S.D. Burley, C.D. Curtis, and J. Esson, 1995, Complex cementation textures and authigenic mineral assemblages in Recent concretions from the Lincolnshire Wash (east coast, UK) driven by Fe(0) Fe(II) oxidation: Journal of the Geological Society, London, v. 152, pp. 157–171. Boles, J.R., C.A. Landis, and P. Dale, 1985, The Moeraki Boulders; anatomy of some septarian concretions:, Journal of Sedimentary Petrology. v. 55, n. 3, pp. 398–406. Chan, M.A. and W.T. Parry, 2002, 'Mysteries of Sandstone Colors and Concretions in Colorado Plateau Canyon Country PDF version, 468 KB : Utah Geological Survey Public Information Series. n. 77, pp. 1–19. Chan, M.A., B.B. Beitler, W.T. Parry, J. Ormo, and G. Komatsu, 2005. Red Rock and Red Planet Diagenesis: Comparison of Earth and Mars Concretions PDF version, 3.4 MB : GSA Today, v. 15, n. 8, pp. 4–10. Davis, J.M., 1999, Oriented carbonate concretions in a paleoaquifer: Insights into geologic controls on fluid flow: Water Resources Research, v. 35, p. 1705-1712. Hattin, D.E., 1982, Stratigraphy and depositional environment of the Smoky Hill Chalk Member, Niobrara Chalk (Upper Cretaceous) of the type area, western Kansas: Kansas Geological Survey Bulletin 225:1-108. Hobbs, D., and J. Hafnaer, 1999, Magnetism and magneto-structural effects in transition-metal sulphides: Journal of Physics: Condensed Matter, v. 11, pp. 8197–8222. Hoffmann, V., H. Stanjek, and E. Murad, 1993, Mineralogical, magnetic and mössbauer data of symthite (Fe9S11) : Studia Geophysica et Geodaetica, v. 37, pp. 366–381. Johnson, M.R., 1989, Paleogeographic significance of oriented calcareous concretions in the Triassic Katberg Formation, South Africa: Journal of Sedimentary Petrology, v. 59, p. 1008-1010. McBride, E.F., M.D. Picard, and R.L. Folk, 1994, Oriented concretions, Ionian Coast, Italy: evidence of groundwater flow direction: Journal of Sedimentary Research, v. 64, p. 535-540. McBride, E.F., M.D. Picard, and K.L. Milliken, 2003, Calcite-Cemented Concretions in Cretaceous Sandstone, Wyoming and Utah, U.S.A.: Journal of Sedimentary Research. v. 73, n. 3, p. 462-483. Mozley, P.S., 1996, The internal structure of carbonate concretions: A critical evaluation of the concentric model of concretion growth: Sedimentary Geology: v. 103, p. 85-91. Mozley, P.S., and Goodwin, L., 1995, Patterns of cementation along a Cenozoic normal fault: A record of paleoflow orientations: Geology: v. 23, p 539-542. Mozley, P.S., and Burns, S.J., 1993, Oxygen and carbon isotopic composition of marine carbonate concretions: an overview: Journal of Sedimentary Petrology, v. 63, p. 73-83. Mozley, P.S., and Davis, J.M., 2005, Internal structure and mode of growth of elongate calcite concretions: Evidence for small-scale microbially induced, chemical heterogeneity in groundwater: Geological Society of America Bulletin, v. 117, 1400-1412. Pratt, B.R., 2001, "Septarian concretions: internal cracking caused by synsedimentary earthquakes": Sedimentology, v. 48, p. 189-213. Scotchman, I.C., 1991, The geochemistry of concretions from the Kimmeridge Clay Formation of southern and eastern England: Sedimentology. v. 38, pp. 79-106. Thyne, G.D., and J.R. Boles, 1989, Isotopic evidence for origin of the Moeraki septarian concretions, New Zealand: Journal of Sedimentary Petrology. v. 59, n. 2, pp. 272-279. Voigt, E., 1968, Uber-Hiatus-Konkretion (dargestellt an Beispielen aus dem Lias): Geologische Rundschau. v. 58, pp. 281–296. Wilson, M.A., 1985, Disturbance and ecologic succession in an Upper Ordovician cobble-dwelling hardground fauna: Science. v. 228, pp. 575-577. Wilson, M.A., and Taylor, P.D., 2001, Palaeoecology of hard substrate faunas from the Cretaceous Qahlah Formation of the Oman Mountains: Palaeontology. v. 44, pp. 21-41. Zaton, M., 2010, Hiatus concretions: Geology Today. v. 26, pp. 186–189. Dietrich, R.V., 2002, Carbonate Concretions--A Bibliography, The Wayback Machine. and PDF file of Carbonate Concretions--A Bibliography, CMU Online Digital Object Repository, Central Michigan University, Mount Pleasant, Michigan. Epoch Times Staff, 2007, Mysterious Huge Stone Eggs Discovered in Hunan Province Epoch Times International. Photographs of large cannonball concretions recently found in Hunan Province, China. Everhart, M., 2004, A Field Guide to Fossils of the Smoky Hill ChalkPart 5: Coprolites, Pearls, Fossilized Wood and other Remains Part of the Oceans of Kansas web site. Hansen, M.C., 1994, Ohio Shale Concretions PDF version, 270 KB Ohio Division of Geological Survey GeoFacts n. 4, pp. 1–2. Hanson, W.D., and J.M. Howard, 2005, Spherical Boulders in North-Central Arkansas PDF version, 2.8 MB Arkansas Geological Commission Miscellaneous Publication n. 22, pp. 1–23. Heinrich, P.V., 2007, The Giant Concretions of Rock City Kansas PDF version, 836 KB BackBender's Gazette. vol. 38, no. 8, pp. 6–12. Hokianga Tourism Association, nd, Koutu Boulders ANY ONE FOR A GAME OF BOWLS? and Koutu Boulders, Hokianga Harbour, Northland, New Zealand High-quality pictures of cannonball concretions. Irna, 2007a, Stone balls : in France too! Katz, B., 1998, Concretions Digital West Media, Inc.
Kuban, Glen J., 2006-2008. Nevada Shoe Prints? McCollum, A., nd, Sand Concretions from Imperial Valley, a collection of articles maintained by an American artist. Mozley, P.S., Concretions, bombs, and groundwater, on-line version of an overview paper originally published by the New Mexico Bureau of Geology and Mineral Resources.